Fantastic news everyone! Eva’s amazing twin sister Joy recently granted us an Exclusive Q&A! We thank her for her candidness and kindness for being available to us for this interview. Thank you for reading and feel free to leave some message or comments for Joy, Niccolò and Eva. Enjoy!! We’ve added a Swedish translation of the interview and you can read it HERE. Running a vineyard is not a joke, especially during harvest season. What’s a typical day like for you? It is both a period of positive adrenalin and stress all at the same time, especially the days prior to the start of harvest. Once we begin it’s a bit like a marathon, you put your head down and work!! Wine, as you know, is a living thing. Every harvest is a bit like having a new born. It’s fragile and delicate…. since its early stage it already shows its character, its nuances. It’s certainly a very exciting period of the year. Acting is part of your DNA. 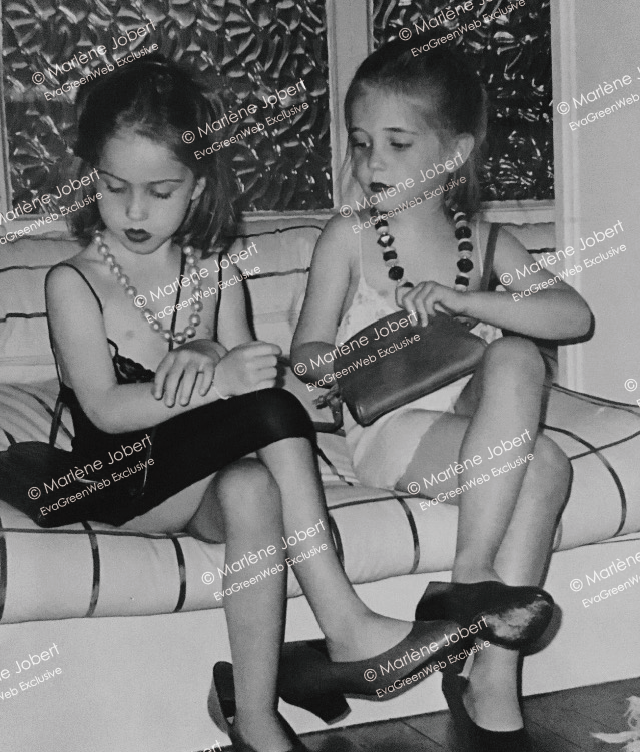 Your aunt Marika, mother Marlène and of course, your twin sister Eva, are all actresses. Did you ever consider acting before deciding to go to business school? What are your favourite performances by Marika, Marlène and Eva? As far as my relatives’ performances, I would probably say that for Marika, it’s “Hanna en mer”. That’s definitely a movie that affected me. I was young when it came out and I still remember it very well. The subject was very tough. My mother’s favorite is “Le Passager de la pluie” (Rider on the Rain) but I also adored “Nous ne vieillirons pas ensemble”, a very different style of movie. She was so naturally talented, so instinctive, visceral…. I would always watch her performing with fascination. Eva’s performance in Miss Peregrine’s Home for Peculiar Children is definitely one of my favorites, but also Penny Dreadful was fabulous. She is chameleonic, jumping from being a witch to a princess and from a trapezist to an astronaut. I really don’t know how she does it!!! There is probably one thing other than acting that ties everyone in the family, that’s the work ethic. That includes our father and myself. It was very clear in our upbringing that without hard work, you don’t obtain anything in life. Like a fine wine, your relationship with your sister has been closer and better with time. What are your fondest memories with her as children and now as adults? We both have very strong characters and maybe our excess of honesty towards one another has created some misunderstandings in the past. In reality, the fundamentals have always been there. Eva and I have always been quite unconventional but in a very different way. With maturity, we both realized how much we can really trust one another even when we see things differently. I guess that’s called growing up, no? We did many silly things as kids, among them one is definitely memorable. Eva and I decided to dress with our mother’s clothes behind her back. You should have seen her face when she saw us age 6 wearing her stuff. Happy is not the word that describes it!! Later, though, she was amused and helped us to put make-up on and took a picture. Eva recently mentioned that you and the kids visited the set of DUMBO where they were surprised to see her in full costume. What’s “Aunt Eva” like with the boys? She is amazing, the kids adore her. Eva could have been a psychologist, she immediately understands what sort of attention the kids need in that moment and finds a way to please them without ever any exaggeration or losing her calm when explaining something to them. She mostly has adult conversations on various topics. She will listen to music with them or even play with the dinosaurs…. She is definitely an eclectic aunt! You named your latest offering, the Le Crocine Cuvée Eva, after your sister. What’s the story behind this? How much of Eva does Cuvée Eva embody? And how did Eva react upon learning that you’re dedicating your latest vintage after her? The result from this organic vineyard surprised us for its unique personality. It was so much in the style of wine that Eva likes, it was almost evident that it should carry her name. Eva was thrilled on the idea, she is very enthusiastic about wine in general. She has quality standards of her own and isn’t impressed by the notoriety of a label. She is definitely not what can be called a wine snob but most certainly a wine lover. Your husband Niccolò is a member of the legendary Antinori wine family and it seemed inevitable for him to join the family business, but every winemaker has a story. 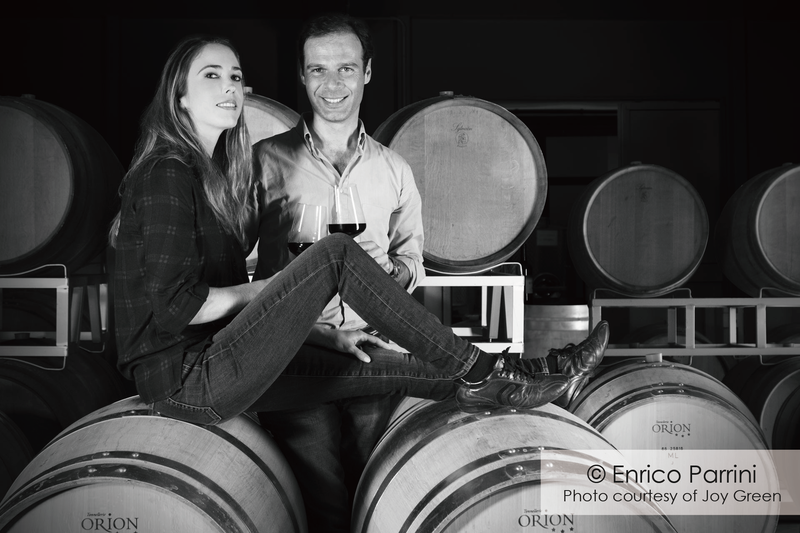 How did you both get started in winemaking? Wine is part of Niccolò’s DNA for obvious reasons, although he came to wine later on in life. He literally dreams, thinks, reads wine. It is almost an obsession…. Also when we travel it is all about wine….. and food. Our passion grew gradually with the knowledge that we are very complementary in everything we do. The initial project was born just out of curiosity and the desire to create something handcrafted with a soul. It is a bit countercurrent in the modern world where everything has tendency of being standardized, but like I said to you earlier, we are all a bit unconventional. Le Crocine is founded by your shared passion with Niccolò. What do you want your wine consumers, be it a novice or seasoned wine drinker, to remember and treasure about your wine? What makes Le Crocine wines special? If I was a good seller, I would tell you that we make it with Moon dust and that John Travolta presses the grapes, but it’s not the case. Kidding apart, our main goal is to produce genuine wines with personality, that reflect our likes. In our view, wine is made to match with food, and when well paired, they intensify or complete each other’s taste. That’s the goal! Having said that, there are many ways of consuming wine and most of the time, the appreciation is related on the mood you are in or the company you are with. Some wines are made to impress, other, more intellectual need solitude and reflections. In our case, we like wines that are immediate, pleasing, joyful. Your passions, be it breeding horses and winemaking, all require commitment, patience and sheer passion. What are your motivations and inspirations? And what is the most rewarding thing about your job as a horse breeder and winemaker? The motivator is definitely passion. It is true though that there are many parrallels between breeding horses and winemaking. Producing wine, in my view, is probably more about sharing. The first time Niccolò and I made a wine, it was in 2012 under the roof of our garage with minimal access to technology. I remember that we selected the grapes in a big basin for hours to remove the green parts. I think my back still remembers that…. A year and a half later, Niccolò came home with a sample to taste and it was wonderful. I couldn’t believe it, I was thrilled. As a breeder, our main success came when a horse we bred won the French Championships for young horses. This mare was the result of the second generation of horses bred by us. It was the coronation of period of our life devoted to breeding showjumpers. 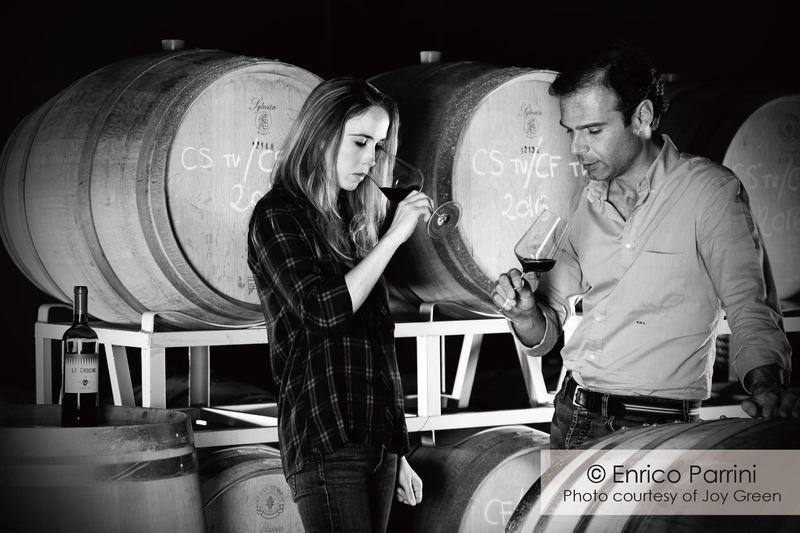 The world of winemaking is very competitive but who do you most admire and why? When you’re not drinking your own wine, whose or which wine do you prefer to drink? There are so many amazing people, I wouldn’t know where to start. Let’s say I admire all the producers that put their heart and soul in what they are doing. Certainly authentic, passionate, genuine winemakers are my favorite. It’s easy to criticize a wine. I find it more interesting to try to understand what the producer has tried to express. It’s a bit like looking at a piece of art. I don’t have a particular favorite wine, it depends on so many variables…. At the moment, I really like to drink entry level Bourgogne Rouge in the 2014 vintage, so fruity and easy. On special occasions, an old Bolgheri or Bordeaux does the trick, but also a nice Brunello. We’ve received a lot of inquiries on how to purchase your wine. Could you expound more on your distribution? We have a very small production that won’t expand unless we find more very interesting terroirs to exploit. Since the start, we were lucky to find enthusiasts that liked the style of wine and that bought all of the production without having to worry about creating a proper distribution. In the last years, after receiving so many enquiries, we slightly increased the production. We do not sell our products directly but only through our worldwide partners. If people are interested in our wines, I suggest to contact us via our website www.lecrocine.it in order to give a proper answer depending on their country of delivery. I hope that people will understand that we will only reply to emails regarding the wines and the estate and not Eva! Lastly, what goals in winemaking are you still working to achieve? Our goal is to be 100% organic very soon. Pesticides helped viticulture in the past to control all sorts of bugs and diseases that attacked the vines, but I feel the world has gone too far. Our responsibility is to make a quality wine and preserving this wonderful planet for the next generations ahead. All photos courtesy of Joy Green with full credit to ©Enrico Parrini and ©Marlène Jobert. Please do not take without permission. Interesting interview! I really wish the best for Joy and Eva for the future. As an Italian I am very happy that part of the Green family lives here! I appreciate so much the passion that both of you put in your own jobs and that’s fantastic! I love Eva! She’s definitely one of the best actresses I’ve seen. I’d really like to see her play The Doctor in Doctor Who. I’m a big fan. I always wish Eva and her family all the best!! that’s such a sweet picture of baby eva and joy! such a lovely, lovely interview, thanks so much for this EGW and Joy! All the best to both Eva (whom of course I admire so much) and Joy and their family! Thank you so much for this! I certainly hope I can purchase a bottle that Eva recommended (with her signature on it). I’m very much interested in seeing what makes her enjoy it so much. (Then again; I’m a musician and I love almost all spirits!). The great god Dionysus said, that wine embodied a dual nature commodity, it could aid happiness as well as introspectiveness… and it was due to that duality that he lived his life on, as the god taught others on how to make wine, and as a result, its various natural benefits on the many journeys… The concept of the soul is not unfounded. Did you know that in Egypt they had cultivation of wine cause of its divination? I’m drawn to Ancient Egypt, so somehow I know these. It’s curious how many aspects are perceived for some, based on this culture… If it was in past cultures, it wouldn’t be unusual, but filled with comprehension. Hopefully, it’s an inspiration for others, to start thinking on their self individual nature contribution, and maybe even begin to cultivate some gardens. In a time where people do petty things for envy, hostility or any type of emotion. I don’t know about wine making, just only its environmental properties… but I would like to learn. I never tried a truly good wine, so I don’t know how to pick them apart. There are important things in this world, what they don’t usually teach you, our humanity connection to what is around us, and perhaps that’s what sincerely makes it all worthwhile. ME PARECE MARAVILLOSO QUE JOY PUDO FORMAR UNA FAMILIA, ADEMÀS DE LA FELICIDAD DE QUE TIENE EVA DE PODER COMPARTIR A SUS SOBRINOS. NO ME CABE DUDA QUE SERÀ UNA EXCELENTE TÌA. DESEO PARA LAS HERMANAS GREEN, PARA EL ESPOSO DE JOY Y LOS PADRES DE ESTAS GEMELAS UNA VIDA PRÒSPERA , LLENA DE FELICIDAD Y ÈXITO. LA ÈTICA Y LA HONESTIDAD EN EL TRABAJO LES HA PERMITIDO ENCUMBRARSE PARA EL EL RESPETO DE TODO EL MUNDO. .